Annual Membership fee for one person. Lifetime Membership for one person. To be the most effective, responsive and sustainable children’s charity that we can be, committed to supporting the children of Barbados and the Eastern Caribbean, especially those who are sick, physically or mentally challenged, through the improvement of the care given to them and the quality of their lives in general. 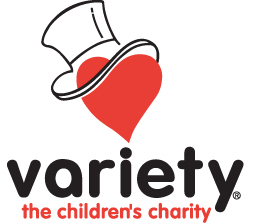 Variety the Children's Charity is one of more than 40 'tents' throughout the world, including Australia, France, Israel, USA, United Kingdom, New Zealand, Channel Islands, Ireland and Canada and has been active for 80 years. Variety the Children's Charity of Barbados was registered in November 1994. Our goal is to raise funds for sick, disadvantaged and disabled children in Barbados and the Easter Caribbean. The Pediatric Intensive Care unit (PICU) at the Queens Elizabeth Hospital, Barbados was one of the first beneficiaries of Variety Barbados. The Gold Hearts Campaign, which runs throughout February, netts over $70,000 each year. Over the years many different organizations, schools and individuals on the island have benefited from the charity including: Because of Jenna Trust, the Paralympic Association and the Autism Association of Barbados, Spectrum Possibilities, Special Needs Units and A C Graham Development Centre. Variety the Children's Charity provides Sunshine Coaches for the A C Graham Development Centre, The Challenor School, The Ursuline Schools and the Sunshine Early Stimulation Center in Barbados. 1. Simply displaying one of Variety’s coin collection boxes in your company by your reception desk or checkout counter. The value of that small change cannot be underestimated as it can help towards the purchase of specialized medical equipment for the Pediatric Intensive Care Unit (PICU). 2. Supplying skipping ropes, basketballs, computer programs for one of our local special needs schools. 3. A staff fundraising event is also a great way to support Variety. Many companies will match $ for $ donations raised by their staff. 4. Sponsor a 'Sunshine Coach". This is a specially equipped vehicle for transporting children with disabilities to and from school and or treatment and other social activities.